Kings Langley, home of Ronford-Baker, is a short 5-minute ride from Leavesden Warner Bros Studios, former home of Harry Potter and his films. 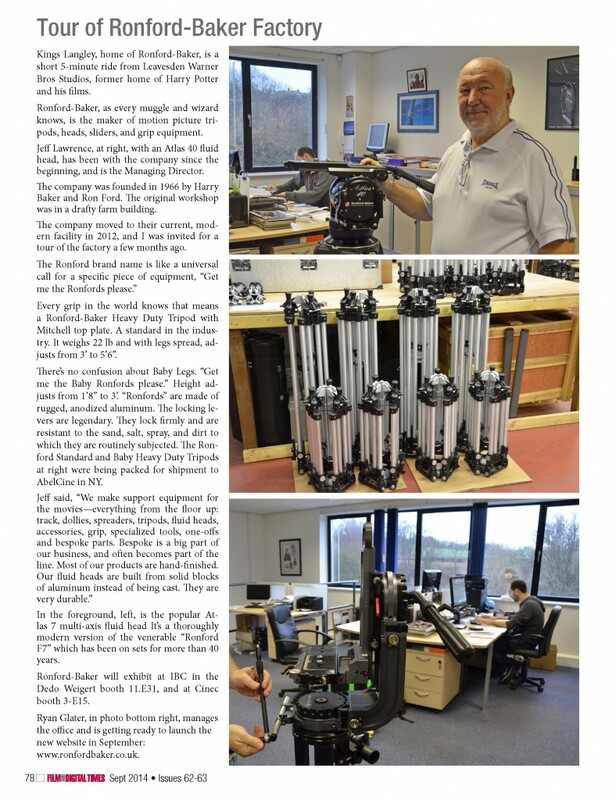 Ronford-Baker, as every muggle and wizard knows, is the maker of motion picture tripods, heads, sliders, and grip equipment. Jeff Lawrence, at right, with an Atlas 40 fluid head, has been with the company since the beginning, and is the Managing Director. The company was founded in 1966 by Harry Baker and Ron Ford. The original workshop was in a drafty farm building. The company moved to their current, modern facility in 2012, and I was invited for a tour of the factory a few months ago. a Ronford-Baker Heavy Duty Tripod with Mitchell top plate. A standard in the industry. It weighs 22 lb and with legs spread, adjusts from 3’ to 5’6”.